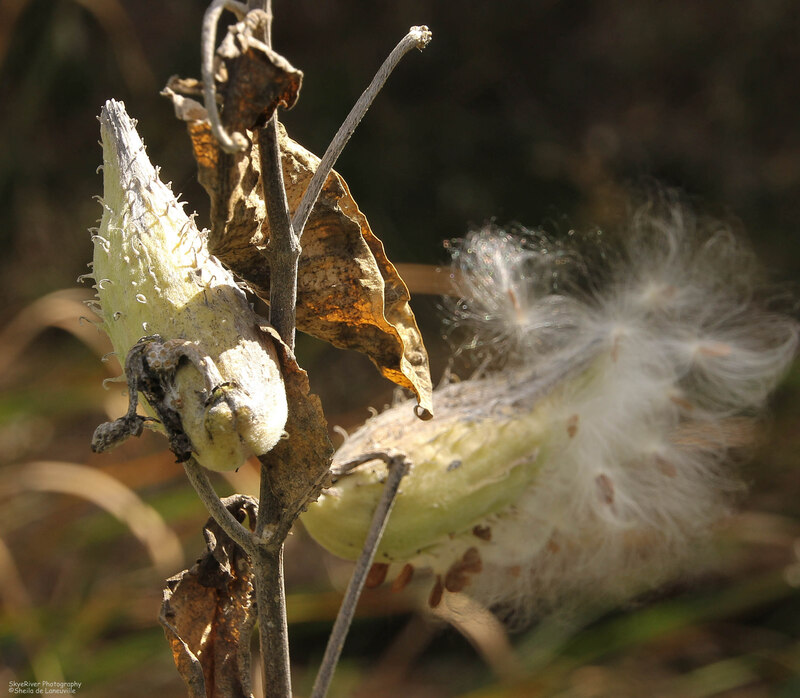 While on a walk yesterday, I saw these Milkweed plants growing along a stream. I thought they were beautiful. 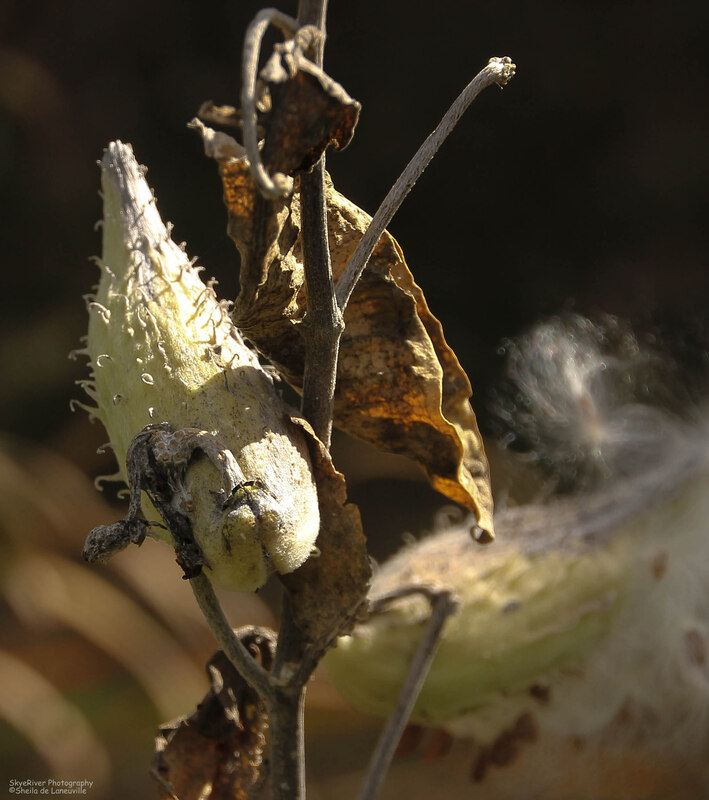 It was fun seeing the detail of the pods through the lens of the camera. 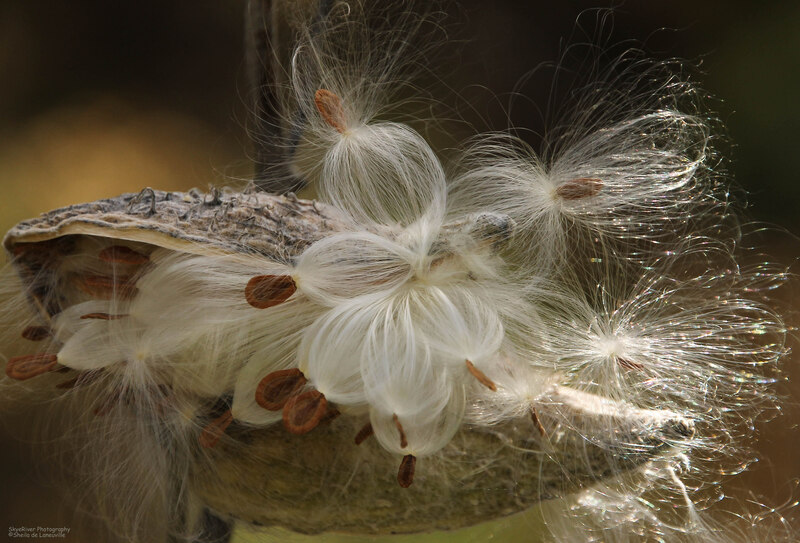 Milkweeds are an important nectar source for bees and other nectar-seeking insects, and a larval food source for monarch butterflies and their relatives, as well as a variety of other herbivorous insects (including numerous beetles, moths, and true bugs) specialized to feed on the plants despite their chemical defenses. It truly is! I wish everyone would take the time to truly notice and appreciate nature! Thanks for writing! beautiful and so delicate looking. Mama Nature outdoes herself this time of year. She sure does! 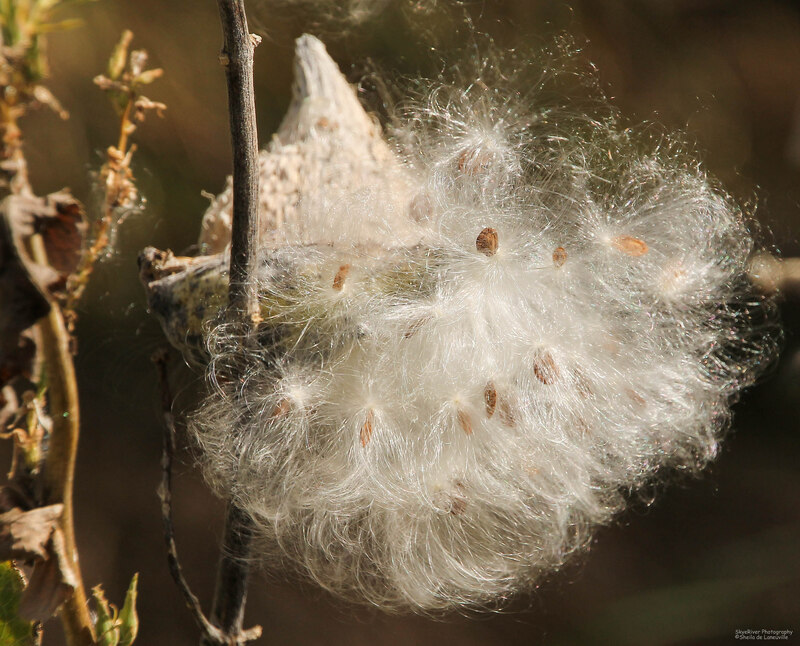 To look at Milkweed from a distance one would never guess what they look like up close! I was amazed! Good Morning to you! Hope you have a great day! Thanks for writing; i enjoy your comments! Thanks Cubby! I am glad I enjoy taking macro photos. One never knows what one might see through the lens! Wishing you a joyful day and inspirational writing! I adore your poetry! Karla, it sure does look like angle hair! Thanks for taking the time to write and thanks for the email; will write back and let you know our plans. We are looking forward to seeing you guys very soon. Glad you are getting to do some fun stuff in W2! Love and big hugs back at ya! I have to say Sheila, these photos made me smile! I love the way the light shines through the silky strands. 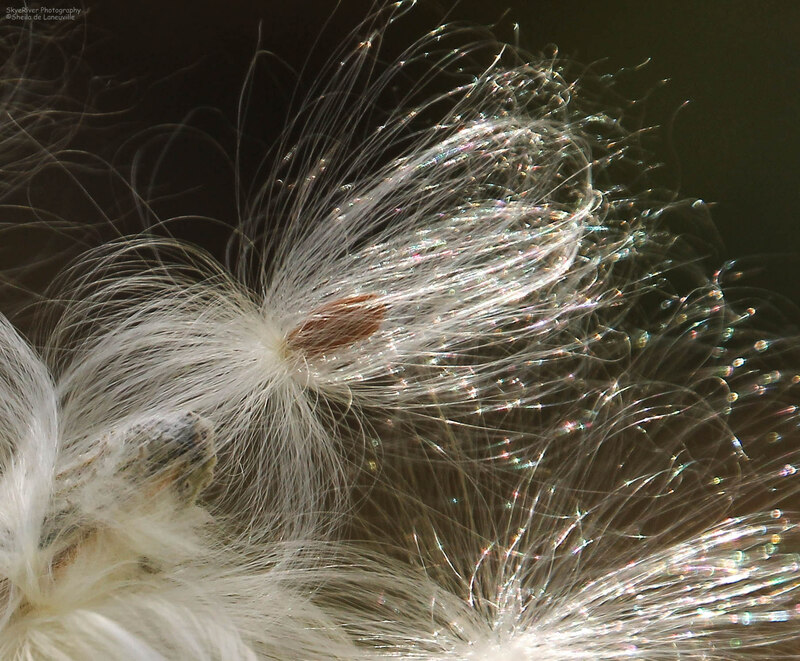 Just beautiful…I must make myself get out my macro lens and practice. Your photos are inspiration. I always enjoy opening up your posts! Thank you Gay, I appreciate it very much. Yes, get out that macro lens and play. It is a lot of fun for sure! You just never know what you might see when looking through a macro lens! Surprises wait! Just gorgeous, Sheila… Love the texture and light!! Interesting info. I love the photos! Thank you Kathie! So glad you came by for a visit.